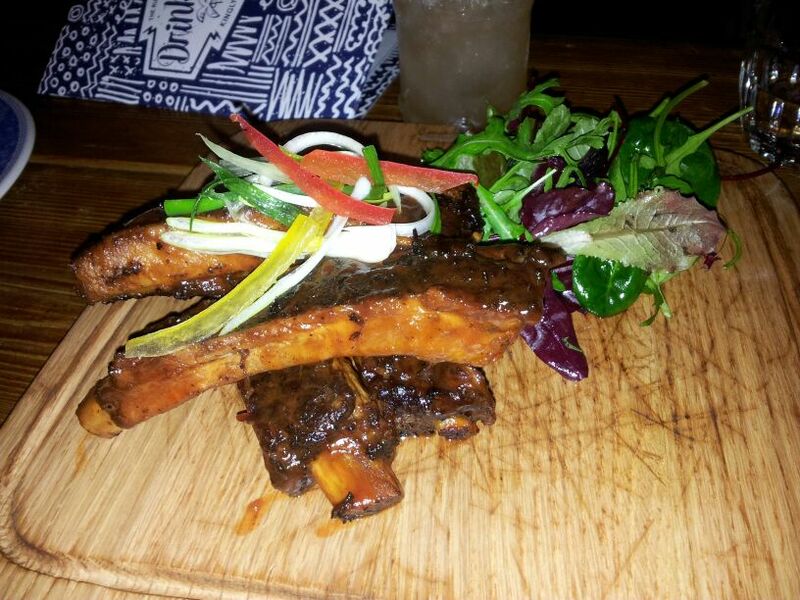 Wednesday was the press night for The Rum Kitchen in Carnaby Street and after having a quick glance over the menu I couldn’t wait to get down and sample the Caribbean cuisine. 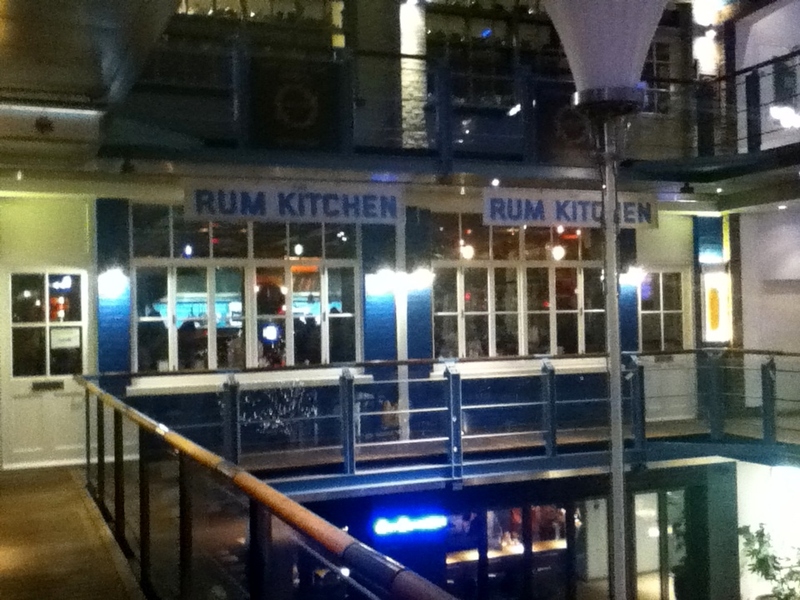 Located in Kingly court just off Carnaby Street, The Rum Kitchen invites you in with their chill out music, low lighting rum shack and inviting door host Carmen. As you enter the restaurant there is a bar on the right with wine glasses dangling down from the shelves. 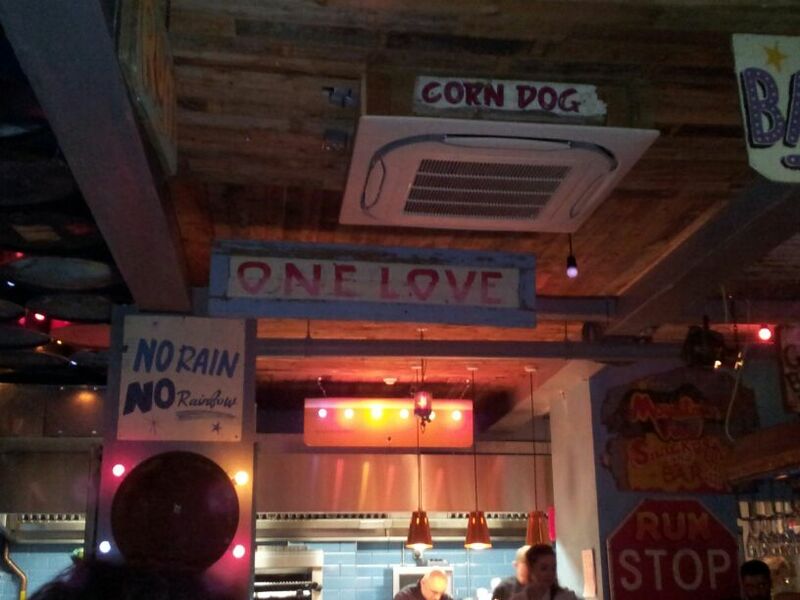 The decor was relaxed and colourful, with sign posts saying ‘One love’ and ‘Rum Stop’ just in front of the kitchen, which was slightly open to allow you to see the food being prepared. Although busy and soon after 7.30 all the tables were filled the service was not short of attentive at all, rather our waitress made sure to check up on us, make recommendations as well as ask our opinion on the place and the food. We started the night in a great way, with cocktails! 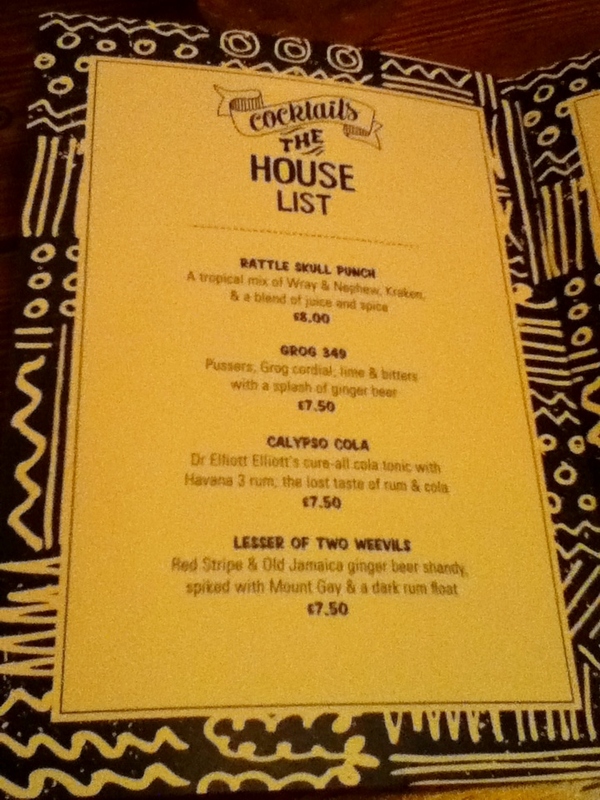 I opted for one of the several rum cocktails on offer, which was a take on the hurricane. When I was in New Orleans, the hurricane was the most incredible drink. I described it to my boyfriend explaining that it came in a huge plastic shoot when I was over there so when the two cocktails arrived and one was in a short glass and one was in a long I automatically assumed the long one belonged to me. However I was wrong and it actually came in a short glass. This wasn’t a problem as the rum and fresh fruity flavour was delicious. The only problem was I had it finished within 5 minutes! To start I had the Saltfish fritters with chilli jam and lime and Craig opted for the ribs. The fritters which consisted of potato and swordfish deep fried were absolutely delicious especially mixed with the chilli jam. I would happily buy them again. Craig wanted to try one so I gave him one of the three in exchange for his rib but I must admit I much preferred the fritters! For the main I went for Mamas Seafood Gumbo and corn bread. I love fish and cornbread but debated whether to get it as the chicken options on the menu were all extremely tempting from the jerk chicken burger served in brioche buns to the jerk fried chicken thighs, however I was interested to see what it would be like. I have to admit it was good but I think chicken would have been a better choice. I was first introduced to corn bread when I was in Byron Bay and it was a complete food revelation. How had I never tried it before, savoury and sweet at the same time it is almost like a cake but because it has corn you can pretend you’re being somewhat healthy with it. Since then I have made it a handful of times using the same recipe and it’s just so addictive. 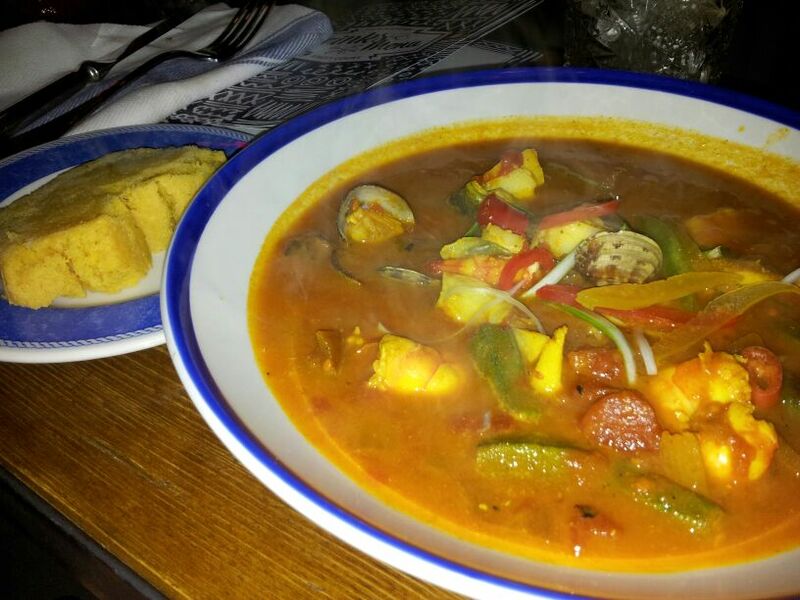 I found the cornbread at The Rum Kitchen a little bland and the gumbo lacking flavour. There was a great selection of fish including prawns, squid, mussels but it didn’t whet my appetite enough. Craig’s jerk chicken supreme beat it hands down with its sweet potato mash and spicy sauce. By this point and after another cocktail I was ready for bed, my tummy was stuffed to the brim, however we still had dessert to get through. We both wanted the chocolate cake but decided to opt for two different ones so we could try each others. Craig went for the chocolate rum cake and I went for banana cake with the butterscotch sauce. I actually found myself eating more of the banana cake, the texture was light and mixed with the sweet sauce and ice cream, it was too good not to eat. 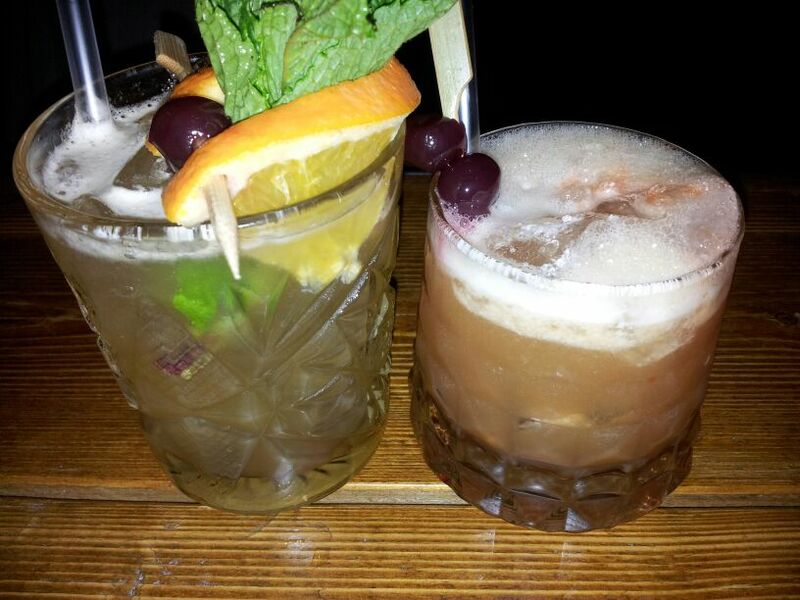 Overall The Rum Kitchen is definitely worth a visit. We had a really fun night and tried some amazing food. 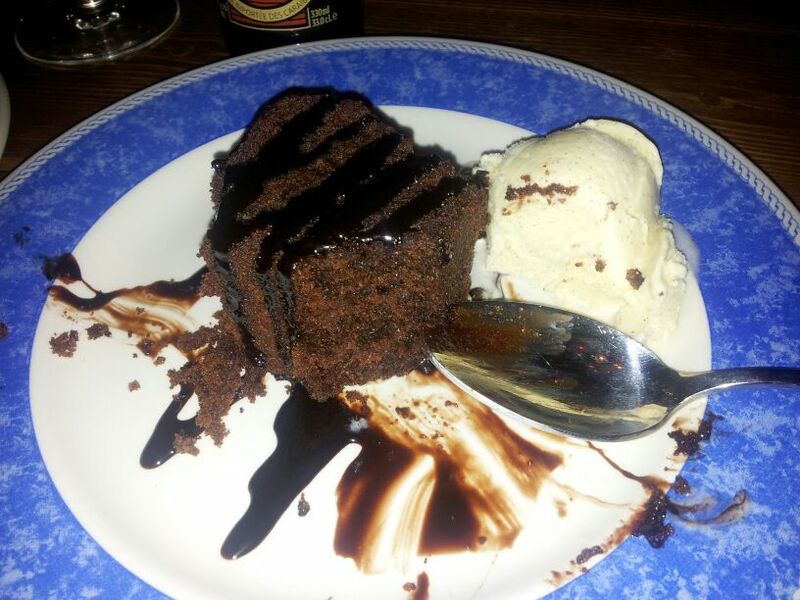 The atmosphere and service really made the evening for me and I would definitely go back again.